Last summer I went on the holiday of a lifetime – 6 weeks driving around France and Italy with my husband and our two daughters, aged 2 and 4, staying a week at a time in places we’d never been to before. 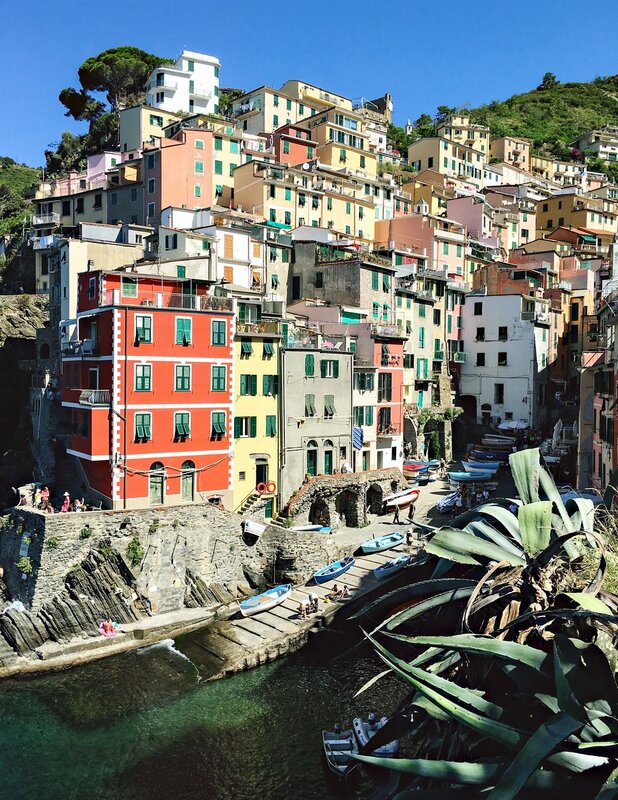 The very first part of Italy we travelled to was Cinque Terre in the province of Liguria – a series of five fishing villages connected by a hiking route, a ferry, and a little train line that seems to cling to the very edge of this spectacular part of the Italian coastline. I’d longed to visit this region of Italy for years, for the rugged scenery and for the ingenious way the villages are built into the sheer rock faces of the coastline. We based ourselves in Riomaggiore and explored the rest of the villages (Vernazza, Monterosso al Mare, Manarola, and Corniglia) by ferry or train as day trips, as well as some of the coastline further on – Portovenere was a particular favourite. For me, the most accessible villages for young kids were Vernazza and Monterosso, mainly because their beaches were slightly more sheltered and easier to access and the towns were less steeply terraced and easier to navigate. Manarola I loved for the views from the coastal walk back towards the town, where you could watch swimmers leaping from towering rocks in the harbour down into the crystal blue waters below. (Oh, how I envied them as we hoisted our little ones on to our backs for the umpteenth time in 30 degree heat!) All five of the villages are visually spectacular, with the pink and ochre-coloured buildings that are characteristic of the region. The Cinque Terre is deservedly popular as a tourist destination, and the crowds can be intense. 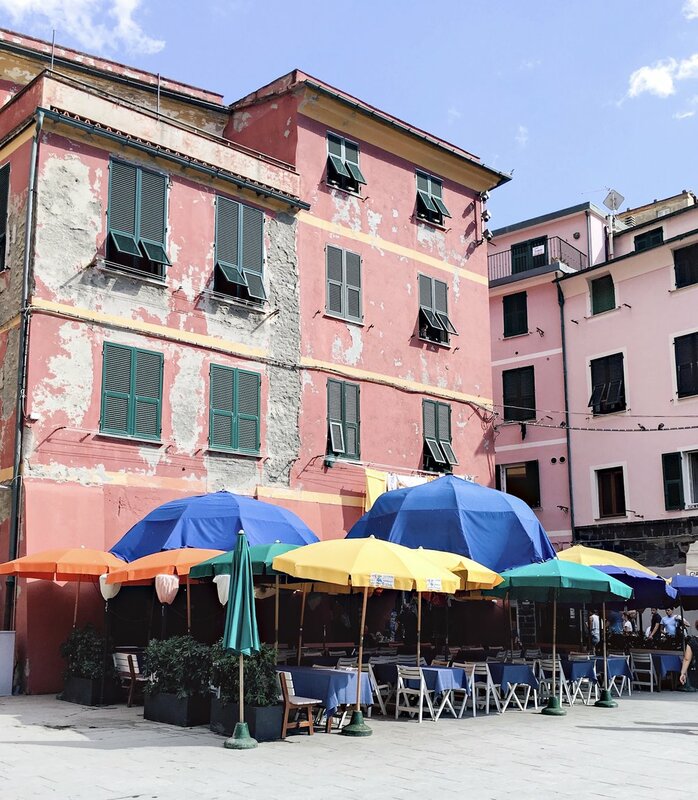 I would say that if you prefer a quieter holiday, then consider staying somewhere further down the coast like Portovenere, Levanto or Lerici and visiting the Cinque Terre by ferry as a day trip. Or plan your visit for May/June, before the summer crowds reach their peak. But the benefits of our little eyrie became apparent at night time, once the kids were in bed and we could finally relax on the terrace with an Aperol spritz, watching the sun go down until eventually the sea and sky were black – so black that you couldn’t tell where one ended and the other began, or whether the little twinkling lights that appeared on the horizon were boats or stars. As night fell, one of us (let's be honest, usually my husband) would make the trek down into the village to buy paper cones of tiny fried fish and local seafood, and we'd sit for hours on our terrace with that spectacular view in front of us. This was the most memorable part of our holiday – a chance to unwind and relax, for my husband and I to lie back on deck chairs still warm from the heat of the day and make the most of our time alone together, once the demands of the children had faded away and we could be together, alone. For me, it’s not just the place that makes a holiday memorable – it’s the people too. This was the first time we’d had the luxury of such a long holiday as a family, and to be suddenly transported away from the daily grind to this magical place, and to be able to experience it together, was an incredibly special experience. British Airways Holidays has teamed up with HuffPost Travel to celebrate those amazing little moments that make your holiday unforgettable. Share your favourite holiday moment and you’ll be entered into a draw to win a city break in Rome. This post was created in partnership with British Airways Holidays.